As part of the North Carolina Research Triangle region, Durham is home to 9,500 students and employees at North Carolina Central University (NCCU) and 50,000 students and employees at Duke University and Duke University Health System. The Durham Comprehensive Plan includes a statement on Complete Streets, and the Watch for Me NC program’s efforts complement this commitment to infrastructure for nonmotorized travel modes. Durham has also adopted a Vision Zero policy, and Watch for Me NC will inform the town’s communication strategy surrounding the policy. The Durham Transportation Department has developed meaningful partnerships with a variety of local agencies. 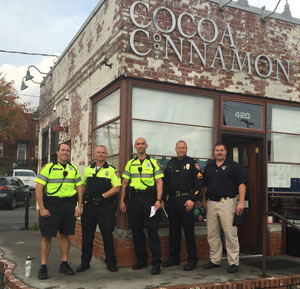 Watch for Me NC works with NCCU, Duke University, Durham Police Department (DPD), Bike Durham, Durham Bicycle Coop, and the Durham-Chapel Hill-Carrboro Metropolitan Planning Organization (DCHC-MPO). The Durham Bicycle and Pedestrian Advis ory Commission and Duke University have been particularly beneficial partners. Active in the Partnership for a Healthy Durham, staff from Duke liaises with Safe Routes to School programs and worked to involve health organizations in the initiative. Durham has been able to take advantage of several opportunities to share the Watch for Me NC message. 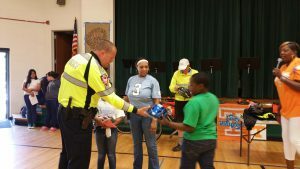 Materials were distributed at Bike-a-Bull City, Bull City Play Streets and Tour de Fat events, to name a few. The city ensured that Watch for Me NC had visibility in number of places including neighborhood meetings, schools, libraries, local bicycle shops, and City Hall. Watch for Me NC also partnered with Bike Durham to conduct safety training for taxi, bus, and paratransit drivers. Three foot by eight foot banners were set up along several corridors where there have been pedestrian and bicycle collisions. 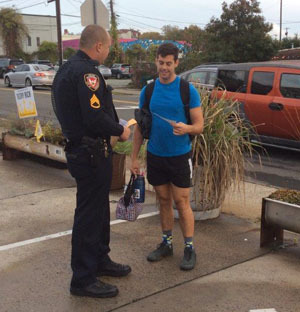 Durham Bicycle Co-op and the DPD collaborated to hand out Watch for Me NC bike lights. Additional regular enforcement activities have focused on areas around schools and crosswalks, with the aid of Watch for Me NC handouts. Officers have partici pated in Walk to School Days at several schools. An improved relationship between area planners and the DPD has been one of the most valuable outcomes of Watch for Me NC in Durham. The relationship between the Transportation Department and DPD has been open and communicative, and the police department has been receiving positive feedback from its enforcement actions. DPD has incorporated the Watch for Me NC program into practice and places a new emphasis on traffic enforcement to improve bicycle and pedestrian safety. One of the key lessons learned was the need to develop to tailor enforcement and education activities to meet the needs of the specific site. In addition to the need for a context-sensitive approach, the scale of events was also considered. The Durham Watch for Me NC partners participated in several large, well-attended events as well as small, targeted events so as to increase awareness for different audiences. Due to ongoing and active participation in Watch for Me NC, Durham now enjoys well-coordinated long-term local partnerships in the program. Thank you to Dale McKeel, Bicycle and Pedestrian Coordinator with the Durham Transportation Department and the DCHC-MPO for providing leadership, time, and expertise that contributed to the Watch for Me NC Campaign in Durham and the information in this profile.